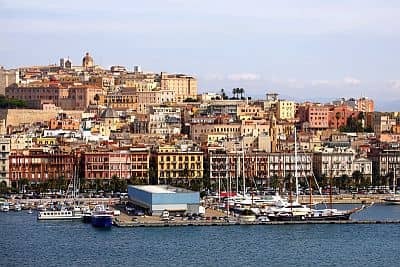 In Cagliari, the capital of Sardinia, the climate is Mediterranean, with mild, rainy winters and hot, sunny summers. The daily average temperature ranges from about 10 °C (50 °F) in January and February to about 25 °C (77 °F) in July and August. During winter, it is rarely very cold, however, there may be a few cold days, with highs around 10 °C (50 °F) and lows around freezing, or even a few degrees below. Snow is very rare: for example, it snowed in January 1985 and January 1993. In summer, the hottest days occur when the southern wind (scirocco) blows from Africa: in these cases, it is possible for the temperature to reach or exceed 40 °C (104 °F). The rainfall is not abundant, in fact it slightly exceeds 400 millimeters (16 inches) per year; this happens because weather disturbances pass quickly and are soon replaced by the mistral, the northwest wind blowing from France, fresh and dry. Here is the average precipitation. The sea is warm enough for swimming from July to September, whereas in June and October it is quite cool. Here the temperature of the sea. The amount of sunshine in Cagliari is very good in summer, when clear skies prevail; in winter, there is an alternation between sunny periods with periods of bad weather, with rain, wind and thunderstorms. On average, there are 4 hours of sunshine per day in December and January, and 11 hours in July.